I offer a range of printmaking experiences, from screen and woodblock printing workshops, drop-in quick prints, to live screen printing for events. An excellent workshop for libraries or schools looking for a creative introduction for visitors or students. Approachable workshops that introduce participants to process via screen or woodblock printing. Utilizing pre-exposed screens or woodblocks designed in advance to explore ideas supporting your cause or institution. Great for the beginning screen printer. 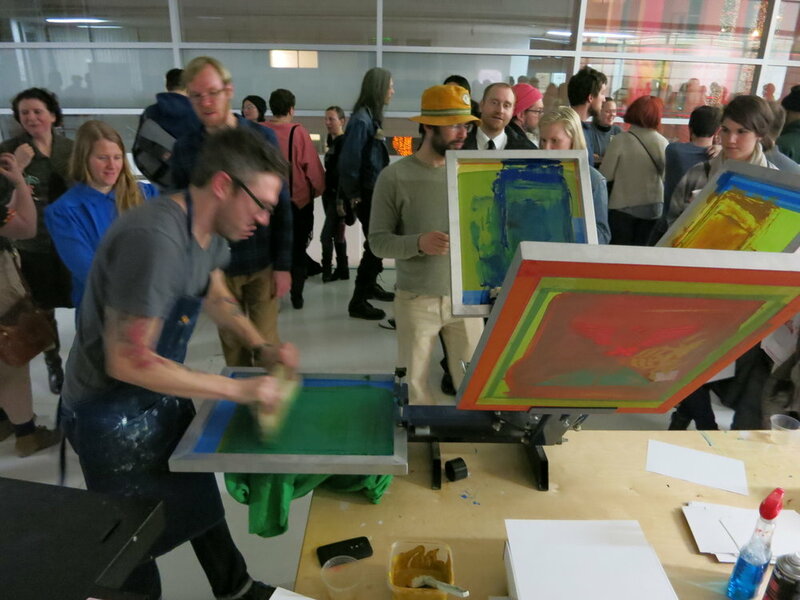 This is a 4-hour workshop and introduces participants to the tools and photo process of screen printing. We will cover the basics of image creation, exposure of screens, and printing. Once we've got that we'll discuss the best papers, inks for different projects, and cleanup. No screen printing experience necessary! Great for the beginning woodblock printer. This workshop is a 4 hour workshop and introduces participants to the tools and photo process of woodblock printing. We will cover the basics of image creation, block carving, and printing. We will discuss the best papers, inks for different projects, and cleanup. No printing experience necessary! Some seriously engaging promotion. Screen or block printing are available for your party or event. We will develop art that promote your cause or brand, printing parties are great for many events. Pop-ups, concerts, art openings, festivals, private parties, fundraisers, and launch events. Anytime you are looking to create a buzz and make some great prints while doing it.